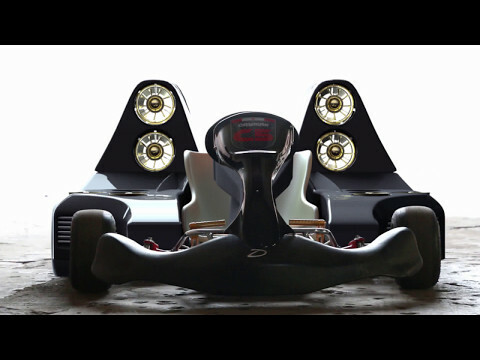 DAYMAK Launches the Daymak-C5-Blast Go-Kart, the Fastest Go-Kart in the World!!! TORONTO, May 11, 2017 /PRNewswire/ -- Daymak Inc. is proud announce its new product called Daymak-C5-Blast Go-Kart, what the Daymak team believe will be the fastest electric go kart in the world. Aldo Baiocchi, President of Daymak states, "We have developed the fastest 100% clean energy go kart in the world by far. We plan to achieve 0 to 60 in less than 1.5 seconds!!! It will be a little faster than the Tesla P100D. According to the Guiness Book of World Records, the current record is being held by Hochschule Osnabrück Institut MuT, which was clocked at 0 to 60 in 2.635 seconds." The C5 Blast Go-Kart features a liquid cool 10000w watt motor, Daymak Drive controller, 8 EDF motors for combined output of 96 kg of upwards thrust and 4 rear EDF motors for 60kg of forward thrust. The Go Kart weighs approximately 200kg, but after turning it on using the EDF motors and Daymak technology to balance the weight, goes down to approximately 100kg, making it extremely light and fast. The Daymak-C5-Blast Go-Kart will be built in the new Daymak manufacturing facility located in Toronto, Canada. There will be two versions offered: 1.) Daymak C5 Blast regular with only 1 motor retailing for $9999 USD and 2.) Daymak C5 Blast EDF model for $59,995USD. Preliminary testing has the unit hovering around the record already and only in its alpha stage! "We have a working prototype and we are currently looking to apply this technology to a variety of projects and are actively seeking strategic partners and investors to bring it to the next level. The potential are limitless," states Jason Roy, Vice President. "We went through all this effort to break the record so we figured 'Hey might as well smash it!' And to have a Canadian company hold the record in engineering is pretty awesome! We just have to find someone fearless enough to drive it!" finishes Akili Sylvester, Lead Project Manager on the Daymak-C5-Blast Go-Kart. "This technology could be applied to any vehicle and give boosting power unheard of before. If you want to go faster call us! We will make your car fly!" states Aldo Baiocchi. Daymak's plan is to have Guinness Book of World Records to officially validate their current statement soon. Daymak is a Toronto-based company incorporated in 2002 that designs, develops and distributes light electric vehicles (LEV's) with over 150 dealers. Our Mission is to become the leader of Light Electric Vehicles (LEV's) and to reduce the CO2 emissions one electric vehicle at a time by vertical integration from design to development to retail distribution worldwide through our Ebikeuniverse exclusive dealer program as well as offering the best customer experience possible. Daymak's accolades to date include: The Clean Tech North American Award and Profit Magazine's Top 100, 200 fastest growing Canadian companies, and being named one of Ontario's greenest companies.